Today’s Philadelphia Inquirer has an attention-grabbing headline: “For Bucks couple in Vegas, a horrifying view of the carnage.” With a headline like that, you click on it thinking that maybe they were in the midst of the crowd and saw things you can never forget. And, let me tell you, I don’t think they will ever forget the horrifying view of an empty littered lot 35 stories below their posh Four Seasons room the morning after the shooting. The art deco-inspired wall papers and giant shiny silver mirrors to reflect the lights coming in from their floor-to-ceiling windows looking down on the Strip will remain forever in their minds against the backdrop of the litter below them. When this couple reached out to the largest newspaper in their home region to tell their harrowing story, they made sure to pose for a photo in their posh hotel dressed in their most stylish clothes looking appropriately concerned for the little people below. 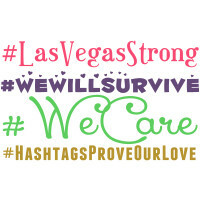 Without it, I’m not sure we could have believed that they had survived such a tragic crime that happened to a group of completely unrelated people 1,600 feet down the Vegas Strip. Hey Ed, What’s This Going to Cost Me? Imagine thinking that this story about you would be beneficial to be in the news. I really can’t fathom that kind of thinking. Too complicated. Stopped listening right there. You have to skewer them in 10 words or less for that to work.